Texwipe’s CrushTube system includes a 100% polyester (hydroentangled) nonwoven material head attached to an internal vial containing 91% IPA / 9% DIW solution, which is enclosed in a protective casing. When the internal vial is crushed, the head becomes saturated with the 91% IPA / 9% DIW solution for Point-of–Use application. Individually packaged in cleanroom compatible material. Lot coded for traceability and quality control. Cleans extremely small areas. 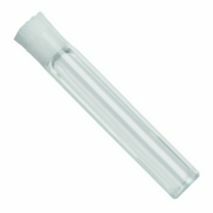 Features a 0.9 mm diameter nylon tip. This configuration provides capillary capabilities to absorb and apply small amounts of solvents and solutions.